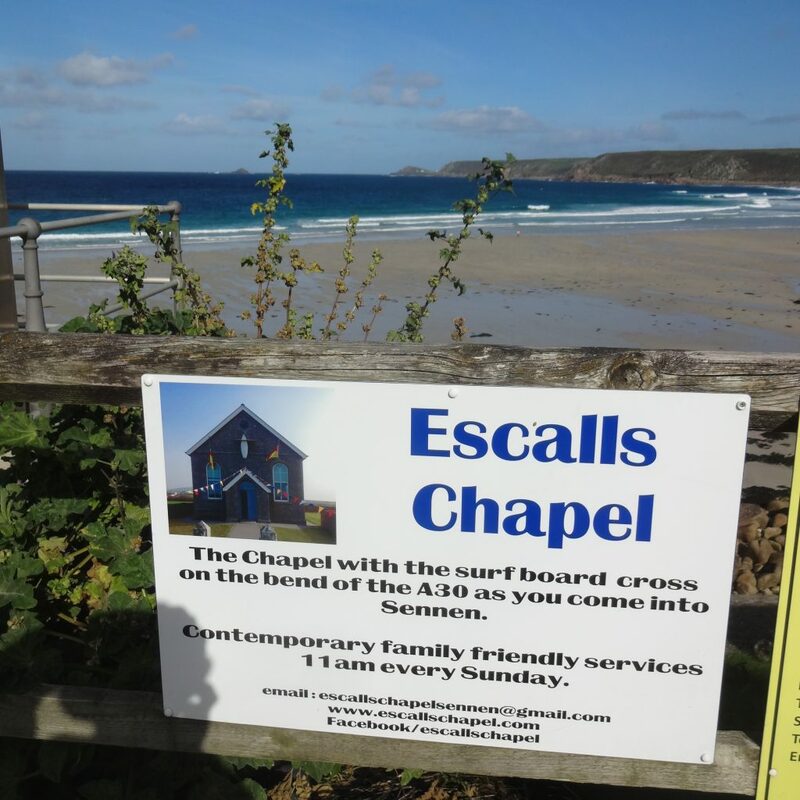 Escalls Chapel situated on the A30 just before Sennen has become known locally as the chapel with the surfboard cross. It has also become something of a celebrity with people stopping to take their picture with the chapel in the background. Our services on Sundays at 11 am are fairly informal with Terry Grant leading us in worship and sometimes David Evans. We have a children’s corner for our Sunday group, who then contribute to the main service with what they have done and learnt that morning. During the summer when we have numerous visitors two of us will take them out to the hall at the back of chapel as numbers become too large. Refreshments are served after the service and people have been known to chat and also ask for prayer at this time, which is encouraged. We have a prayer meeting on Tuesdays in term time from 1 to 2 pm, to which everyone is welcome, and passers-by stopping to see the chapel have been known to join us. Once a month we run the café at Sennen market for different charities and this is a great time to chat to people and tell them about who we are and why we are serving the tea and coffee that morning. We occasionally get asked to pray for people. Some of our members go into the local school to run Open the Book, and this is well received by the children and teachers. It is a chance to get the children to hear Bible stories and pray with us, which they are happy to do. Most are very keen to act out the stories. Although we are a small core of members, our chapel is blessed every week by the Lord, and we feel that serving Him in the community is our privilege and duty. We join with all the local churches and chapels in St Just, Sennen and Pendeen once every two months for coffee and chat so that we can find out what everyone is doing and support them. 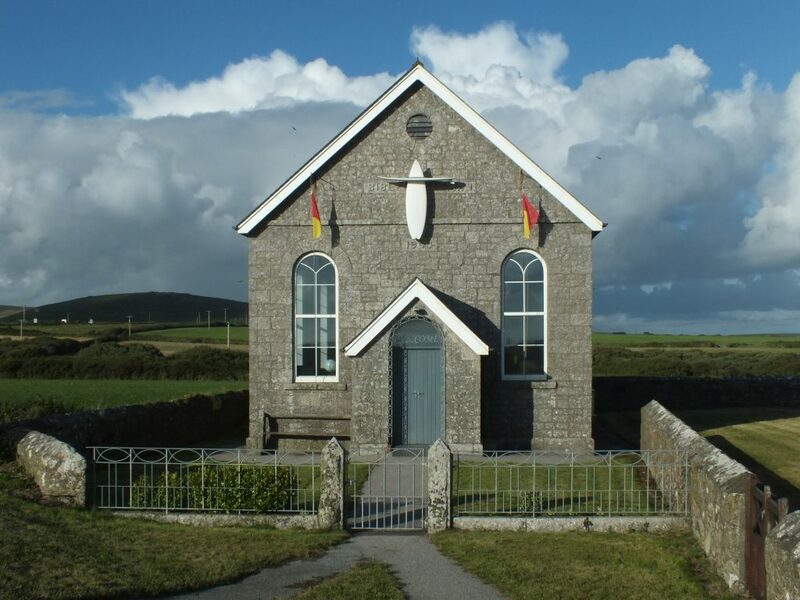 The church building is on the A30 between its junction with the B3306 and Sennen. The nearest postcode is TR19 7BQ. There is a car park next to the building.